Congratulations to Prospect Grange who received first place for their community service report for Granges with membership of 50 and under, and to Ekonk Grange on their first place entry for Granges with a membership of 51 and over. Ekonk Grange’s entry went on to place third on the National level! We are a community-based organization. The Grange was founded to make the community a better place to live and in this way we are all community granges. The heart and soul of every local grange is service and involvement in our communities. They say “what goes around comes around”. When you do good things good things happen to you. Helping in your community to benefit others will bring you and your Grange good things - pride, satisfaction, recognition and active members. Remember, a good patron dispenses charity. The ways in which you do it are infinite. Debbie and I are pleased to be your new community service chairpersons, and look forward to seeing your reports and notebooks in September. Your entries will again this year be judged in two categories - Granges with membership of 50 and under and those with membership of 51 and over. Please note the due date of September 1, 2011. We challenge you to become more involved. Make a difference! 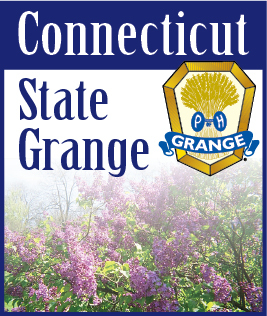 One community service project or activity is now required for the Honor Grange Program, and we would really like to see all Granges participate.